I have just started restoration of an 11' 0" Merron dinghy with original enamelled 'Thames Conservancy' registration plate dated nov. 1947. 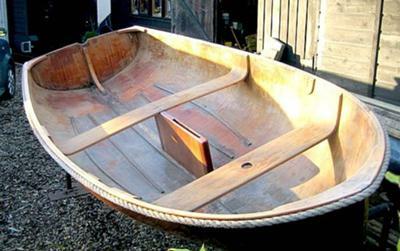 It's the first autoclaved ply dinghy sold in the UK and is similar to the Fairey Duckling. It's very original but has no mast or rigging however I'm confident that I will source something suitable. The problem that I have is that there is no rear thwart and no signs of original fixings for one although for practical purposes one must have been fitted when built. Does anyone have any knowledge of the 'Merron' and it's rear thwart as I would like to keep it as original as possible? Embarrassed to see it has been 6 years since I first responded to this Forum. A lot has happened in between. We fought off a traveller incursion and then I prepared and sailed my home built Eventide and round the UK! See www.eventides.org.uk and the Logs page. Now determined to finish the restoration of the Merron and get her afloat. Hopefully this year! Great to read the additional information. I will add some pictures as I progress. If it is of any help I am Ken Merron, son of Arthur Merron who originally developed the process for hot moulding plywood which he used to build these small dinghies after the war and of course various other boats and parts of the DeH. Mosquito during the war. He cooperated closely with Faireys over the years eventually passing them all the boatbuilding. If you have any specific questions, I'll try to fill in the answers for you. The boat in the latest posting looks just like the one I had as a child. It is the sailing version and has no stern thwart. The construction is usually 1/16" Honduras mahogany either side of 2 x 1/8 longitudinal spruce (left over from Mosquito wing spars?). By the way I have recently acquired one of the dinghies myself to restore for his great-granddaughters. Charles's query on the Merron - origins of the cold moulding process. Dad, who sailed the dinghy's mentioned and owned no 2 Flying Fifteen, Ballerina told me the process was developed in the production of the Mosquito fighter fuselage. It was quick, cheap and made a strong but light airframe. I am the archivist of the Fairey Owners’ Club researching the origins of hot moulding, used so successfully by Fairey Marine both for its sailing dinghies like the Firefly and Albacore and also the offshore powerboats like the Huntress, Huntsman and Swordsman. However it seems that in England the moulded dinghies produced by A C Merron probably predated Fairey’s boats. I should like to make contact with Ken Merron, please? Glad to be of help but you still have nowhere to sit! I certainly learned to sail in my first Merron dinghy sitting on some very comfortable kapok-filled cushions on the floorboards. I had 2 of these boats as a child, because my father Arthur Merron owned the company and built them. I have just acquired another one in amazingly good condition which I am prettying-up for his great-grand-daughters. I would be happy to try to answer any questions you may have. In addition to my father's own photographs I have a quite detailed drawing of the sailplan and general layout which was originally published in the Yachting Year in 1947 and which I received at the time of my latest purchase. There do seem to be some variations in length as reported. The boats are 10'2" long and 4'8" wide, ignoring the rope fender. At some point a few were made a little longer but it was found in practice that the hull was difficult to de-mould because of the tumble-home aft. My father took the simple step of shortening the mould aft, thus losing the most pronounced inward turn of the topsides. As you know, the hull consists of two skins of honduras mahogany on either side of a sitka spruce core. The framing is also largely spruce. The reason is that this timber was left over after the end of the war from manufacturing Mosquito bomber components and airborne lifeboats. Ken thanks for clarifying the my query regarding the missing rear thwart on my Merron. It makes sense but with only a centre thwart there is no ideal position to sail other than to sit on the duck boards, which I tend to do. John, it's great to hear of your progress and will try and call in when I'm down your way with mine in tow. I haven't had too many opportunities to sail her this year but hope to next. Nice to hear why the differences in seats and with a name like that one would guess you may have had a conection with the firm! My Merron is still upside down in the shed, but the bottom is now all repaired and epoxied. I have just to finally sand the hull smooth and then paint, next spring 2016. The interior is bare and just needs a light sanding before 3 coats of epoxy internally. I now have bouancy bags and nice bronze captive rowlocks and cleats to fit. A local sail maker is going to make me a new set of tan sails, as the originals could not be found. However the spars seem in good order so we can get all the sail sizes from them, unless anyone has a sail and can let me know sizes. Hoping to get afloat before her 70th birthday! Not sure how old your question is but I just spotted it. 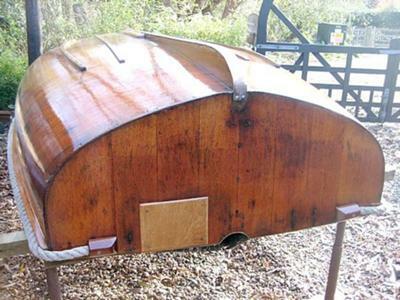 The answer is that some boats were built without rear thwarts but with a laminated knee instead, like yours. The original idea was that if the boat was to be sailed then the tiller would get in the way of anyone sitting on a rear thwart, so only boats without the centreboard box had rear thwarts. Later boats seem to have had both. Back in the late 50s I bought three Kombi dinghies that were made in Norway and sold in Canada through the Greswieg (sp?). I sold two and kept one ,which I still have. It is cold moulded mahogany ply, I still have the original mast and sail and oars. It looks identical to the Merron dinghy. I can confirm that my 'merron' is 10'3" long overall so I feel confident that they were all of one design. I'm looking forward to seeing some photos of your's when the weather improves. I will also be able to post some photos of my floor boards and fittings which are all original. Incedently I now have confirmation from a local 'Broom' expert that my Broom Robb was indeed designed by Arthur Robb so the Merron will be an appropriate tender for her. I'm pleased that I have found another owner, let's hope that more may turn up. Bit difficult as the boat is cucooned in tarps still and now has 6 inches of snow on top, but having stretched the tape over her I find she is 10'6" long, not 9ft. She has a nicely fitted samson post and 3 beautifully moulded thwarts, including one across the stern. The mast and spars are intact and I hope to get the sail from my friend when he clears his cruiser sails out of storage. Also the centreboard plate, (daggerboard) and rudder, that he also has in store. The gunwale is laminated and moulded to take a rope fendering and apart from a little soft timber in the gunwale, that will respond to epoxy I'm sure, all seems sound. The interior has been sanded back to bare wood. Come the warmer weather I will get her cleaned off and take some photos. Sadly there are no old brass fittings inside her and no name plate. I wonder if I can help, yesterday picked up a 9ft Dinghy that for the last 20 years my pal had been storing and we both thought was a Duckling. On turning it over it has the interior that yours has with the same beautifully made thwarts. Has a tiny samson post too! It has a set of spars and a sail and we hope also a rudder and plate, but they are to be found. I shall be repairing slight damage to it in the Spring and it is to be used by my grandson, aged 6 my keen crew! You can contact me via the 'Saving Old Seagulls' website, or just Google it! Arthur C. Robb and Uffa Fox worked together on the design of the airborne lifeboat. And they both had their hot moulded designs built by Fairey Marine. So it is possible that your 'Merron' was, like the 'Duckling' and the 'Dinky', built at Fairey Marine. Thanks Mike for your info. But have followed all leads with little success. I think I will construct a folding rear thwart supported from the transom as the existing seat fixings differ from the Duckling. I have a couple of further questions to which hopefully someone has an answer. Firstly as the Merron was 'state of the art' in 1947 could it have had an aluminium mast? And secondly I also have a Broom Robb 25' motor cruiser which I believe could also have been designed by Arthur Robb but can find no proof. The Merron Dinghy was I believe designed by Arthur C Robb. Apart from that I'm afraid I can't add very much. As you have the original 'Thames Conservancy' registration plate you might be able to get some background information on her original owner from the www.environment-agency.gov.uk. Though they may, like Lloyds, charge a small fee for it. As for the aft thwart, I would have thought that if there had been one that there would still be some sign of it's fixings. There is a photo of a "Duckling" here where the aft thwart is clear show to be resting on a stringer. 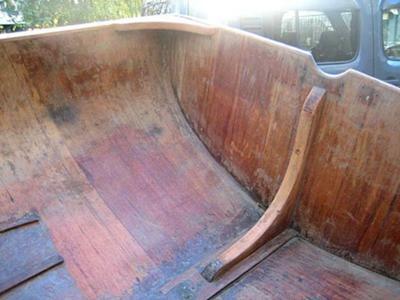 Had your boat had such a stringer it would be virtually impossible to remove all trace of it. Perhaps she was built for someone who specifically, for whatever reason, didn't want one??? If you have some photos of her they might help with your query.